2nd Myanmar Real Estate Summit (MRES) is proud to welcome HTOO Group as Premium Sponsor. HTOO group is committed to sustainable growth and diversifying units while contributing to social economic and environmental obligations to Myanmar & the community. 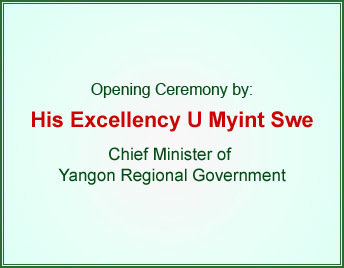 The Chairman of Htoo Group of Companies will give the Welcome Address at this summit. Burgeoning demand, revised regulations and new opportunities are driving Myanmar’s property sector – from refurbished office spaces to serviced apartments to retail outlets. As the country opens up, investments are flowing in to meet the acute shortage of hotels, residential buildings and mixed-use projects. Cities like Yangon and Mandalay are moving ahead recreating themselves as economic and tourism hubs. Old heritage buildings are conserved and retrofitted to commercial entities. Special economic zones like Thilawa&Dawei are bringing in an influx of international investors and sprucing urban and township development. The new tiger economy is attracting big hoteliers like Hilton, Best Western and Keppel to build new hotels to meet tourism demand. As Myanmar’s real estate and property development gleams with golden opportunities, have you identified your niche in the market? Are you able to gain access to the extensive land banks? Are you seeking and cementing JV partnerships to develop property in Myanmar? How soon before foreigners be allowed to purchase and own condominium units? Manage your limitations and challenges ahead with the extensive networking sessions offered with key movers and shakers in the country. Don’t miss out as it’s crucial for your success! Attend CMT’s 2ndMRES to explore pivotal issues critical for investing in Myanmar’s real estate development and property sector. Hotels and resorts landscape in key tourist attractions like Mandalay, Ngapali&Bagan including discussions on financing, commercial terms and many more! Case study on the Junction 8 malls and retail trends in Myanmar by renowned conglomerate ShweTaung Development Co.
What are the key issues for a successful delivery in a demanding environment? Hear from Julien Esch, Business Development Manager of BYMA who has lead and secured the company’s first project in Myanmar in early April 2013, for the design and construction of a 1042 residential units at Star City in Yangon, in partnership with SPA-PM. Employing the Myanmar talents and … retaining them! Using real life examples; Yangon based lawyer Edwin Vanderbruggen of VDB Loi shares his experience on how projects are structured in practice and on what the Government will permit in reality. One MIC Permit or two? Should you license the contractor or the project owner? Can you obtain a license for both? What are the rules for licensing construction projects? How do they work in reality? How to avoid the “Commercial Tax trap”: why does everyone get this wrong? How to split the onshore and the offshore contract: does this affect your ability to import? Are there in reality foreign ownership restrictions for construction activity? Which construction projects have received an MIC license to date? Who Shall Attend Be a Sponsor or Exhibitor! Property investors & developers, Real estate analysts, Construction & engineering firms, Consultants & brokerage firms, Hoteliers, Financiers & lenders, Banks & financial institution, Asset managers & fund managers, Real estate funds, REITs, hedge funds & private equity, Insurance firms, Law firms, Tax consultants, Industry regulators & etc. Following Myanmar Government’s decision to permit three-year lease to owners, the land prices in downtown Yangon have continued to spiral upwards. The price for one square foot can cost up to US$ 800. According to an agent at Shwe Kan Myay Real Estate, currently, a standard 100 by 100 feet condominium can cost a buyer around US$ 8 million. The prices of property in this developing country are the same as real estate prices of major cities in developed countries across the globe. The premier buildings in the country, including Sakura Tower and Sule Business Center, are occupied by foreign investors according to Mizzima. Yangon’s office space is limited and the demand continues to outstrip supply. The question now is – how long will this overwhelming demand support price hikes? According to the Bangkok Post several well-off landowners in prime real estate areas are holding out for higher prices, however, some buyers have already reached their limit. 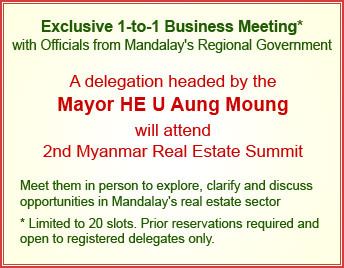 CMT’s 2nd Myanmar Real Estate Summit (MRES) 2013, being held on 30 Sep-01 Oct, 2013 in Yangon, throws light on land ownership, pricing structure, zoning regulations and many more. For more information please visit the Event Page or contact Ms. Grace at grace@cmtsp.com.sg or Tel. +65 6346 9147. Myanmar’s economic developments have spurred an onset of property projects and investment opportunities. International companies of various sectors are rushing to enter the Myanmar market, and this trend is expected to continue to grow, causing a strain on office and residential spaces. The gap between demand and supply in property is likely to persist over the next two years, prompting developers to enter Myanmar. Singapore-listed property developer, Yoma Strategic Holdings, has since tapped on this opportunity presented by the new Asia frontier, with its expansion plans in Yangon involving the development of more hotels, office buildings and large-scale residential properties. Currently, Yoma is building the 135-acre Star City six mils southeast of downtown Yangon. Targeted at Myanmar’s middle-class population, the development includes 9,000 units of apartments as well as a retail area. In an interview with Bloomberg Television, CEO Andrew Rickards stated their intentions in going into “commercial buildings, office buildings, hotels, all of which are desperately needed in Yangon”. Emphasizing on the sector’s importance, Rickards highlighted that property will remain the “only investible asset” in Myanmar. 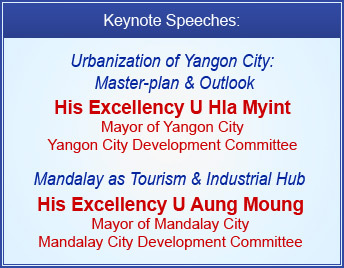 CMT’s upcoming 2nd Myanmar Real Estate Summit in Yangon, September 30 to October 1, 2013, will see Cyrus Pun, Executive Director of Yoma, join as a key panelist. For more information on his session and other speakers, please visit the Event Page or contact Ms. Grace at grace@cmtsp.com.sg or Tel. +65 6346 9147.